Peyton Manning has etched his name into the history books again. The Broncos’ signal caller threw his 51st touchdown pass to eclipse Tom Brady’s single-season record for most touchdown passes in a single season. Manning completed a 25-yard pass to tight end Julius Thomas with 4:28 left in the fourth quarter of Sunday’s 37-13 win over the Texans. He finished the day completing 32 of 51 passes for 400 yards and four touchdowns. Brady set the record in 2007 during the Patriots’ unbeaten regular season. 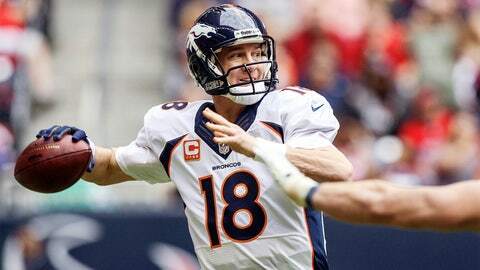 Manning previously had the record when he threw 49 touchdowns in 2004. The Broncos (12-3) will travel to Oakland next week.